Dear friends, today I thought of doing an article on who are we exactly? International medical graduates is a umbrella term for any physician who received his/her basic medical degree or qualification from a medical school outside of the U.S. or Canada, regardless of citizenship, This includes any U.S. citizen who received a medical degree from a school outside of the U.S. or Canada. This working ECFMG definition leaves many questions unanswered like, which countries are the most prolific in contributing to the IMG pool. Where are these applicants coming from? Looking at the white paper published by the American Medical Association (AMA) called the “International medical graduates In American medicine: Contemporary challenges and opportunities” [A position paper by the AMA-IMG Section Governing Council, January 2010], most of us IMGs are citizens of India, followed by Philippines, Mexico and Pakistan. The details of the data are illustrated in figure 1. About a 1/5th of the IMG population constituted of people from India. This may be a consequence of a mixed socio-economic force for the migration of skilled personnel from India to the US. 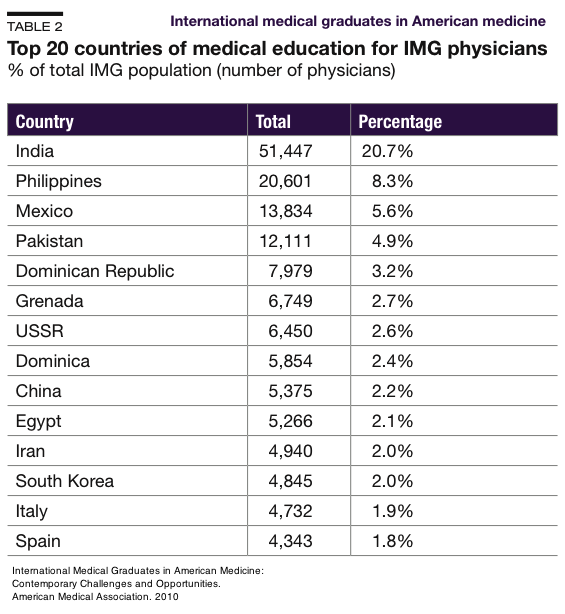 Lack of political commitment, social restrictions (reservation and fragmentation of higher education on Casteist policies, strong primary medical education) all contribute to the drain of physicians from India to the US. This may be true in some way, shape or form for other countries as well. Looking at the data, I began to think, do all the people who are pursuing their dream to practice in the USA start out from their home country. To answer this question, I looked at the country of origin of the visitors to my website (this data is freely available to webmasters from the respective web hosting services, and does not constitute violation of privacy. No data beyond the country of origin of visitors is provided). I was very surprised to see that most of the applicants who are wishing to pursue residency in United States are already in the US! The result is demonstrated in the pictograph, figure two. This figure represents a cumulative sample size of one months worth page views to the IMG, USMLE and residency topic specific website, mle and residency tips. 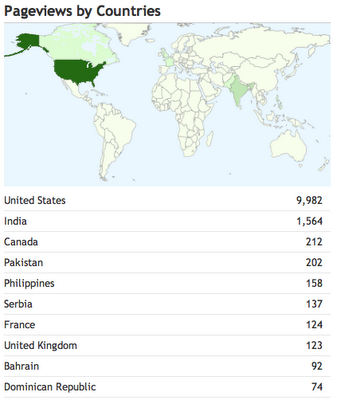 Almost 10,000 views in a month were from USA alone, followed by India, Canada and Pakistan. This was a very revealing piece of information as it demonstrated that though IMGs might belong to another country they still strive to apply for residency from USA itself. Being in the US affords many advantages to the applicant. You can make contact, network, seek volunteer opportunities, do observer-ships and so forth. Thus being in this country does expedite some of the logistical issues and may even be improving the chances of match. This is to not say that people who are working from their home countries are any less, but it certainly puts them at a geographical disadvantage. Since most of the applicant IMGs are already in the US, this kind of proves to be a leveling ground and at least working out the advantage that one gets being in the US of A. This does not end here, read on to the second part of IMGs know your competition.